Sandalwood face pack is one of the best face packs for oily, acne prone skin. I always make sure to use it at least twice a week. I used to mix sandalwood in fuller’s earth and apply it on my face twice a week. Khadi is a great herbal skincare and hair care products brand. I had used few of their products and all did a great job. I had already reviewed their handmade soaps and shampoo here on my blog. Today I am going to review Khadi Herbal Sandalwood Face Pack. Khadi Herbal Sandalwood Face Pack comes in a metal jar with the same colored pull off lid. All the information is printed over the jar. As soon as you open the lid, you will find the face pack filled to the brim. Though the lid is quite tight but I do not think the packaging is safe to travel with. You can always fill the face pack in an airtight container to avoid any spillage. 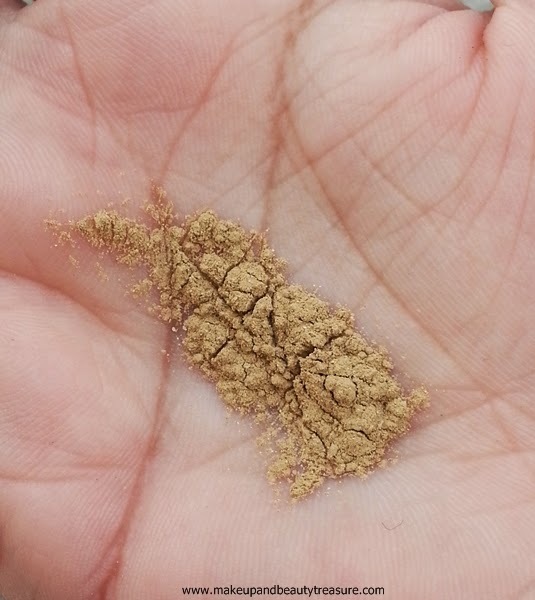 The face pack is yellow brown in color with a predominant smell of sandalwood. The scent is mild, pleasing and won’t bother sensitive noses. 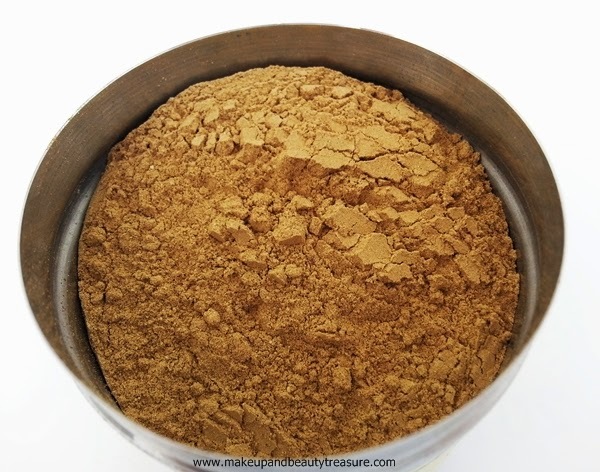 Khadi Herbal Sandalwood Face Pack is in powder form and has soft texture. The company has instructed to make fine paste with plain water or rose water and I love mixing it with rose water. The pack is easy to apply and gets spread easily just like fuller’s earth pack. I make sure to wash my face with a face wash before applying the face pack as it removes all dirt and grime off my skin. It feels cool and fresh on my skin. The sandalwood scent makes the experience all the more delighted. I let it sit on my skin for 15-20 minutes or until it dries up completely. The pack does not give tingling sensation and feels quite cool and nice on the skin. It does harden and tighten the skin due to the presence of fuller’s earth. It is easy to remove and gets washed off easily with water without leaving a residue behind. My skin feels clean, refreshed, smooth and radiant. In case you suffer from pimples or acne, use it twice a week for a month. It helps in subsiding pimples, acne and in detoxifying and preventing the pimples from reoccurring. It is meant for all skin types. It removes impurities and keeps the skin clean and healthy. It does not stain my face unlike other face packs. It is one of the best sandalwood face packs I have ever tried. It also fades acne and pimple marks and makes the skin smooth and even. I have been using it for almost a month and I love the glow it gives to my skin. 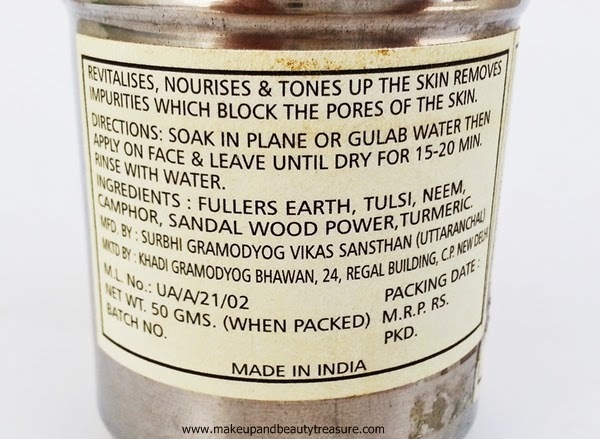 It contains all good and natural ingredients like fuller’s earth, tulsi, sandalwood powder, turmeric that are effective in treating problematic skin. • Gives cooling sensation to the skin when mixed with rose water. • Helps in keeping skin clean and radiant. • Prevents pimples from reoccurring. • Does not give tingling sensation. • Detoxifies the skin making it look clearer. • Does not stain the skin. • The packaging is not travel friendly. 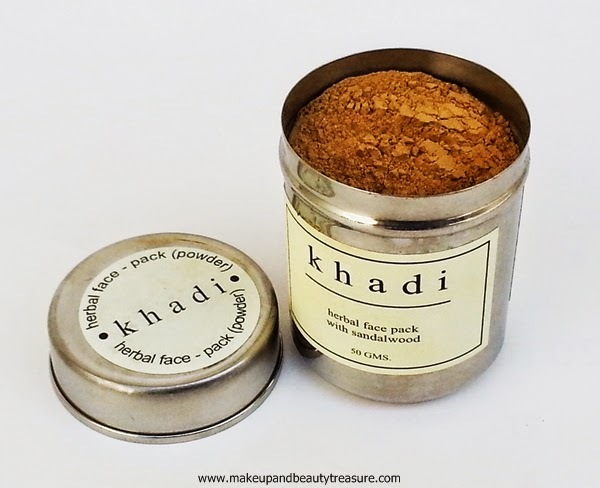 Khadi Herbal Sandalwood Face Pack is one of the best herbal face packs I have tried. It contains all natural ingredients and is very effective to tone up the skin. I love how it works on my pimples and acne. Even if you do not have pimples, use it just to make your skin clean and even. I would highly recommend it to everyone! 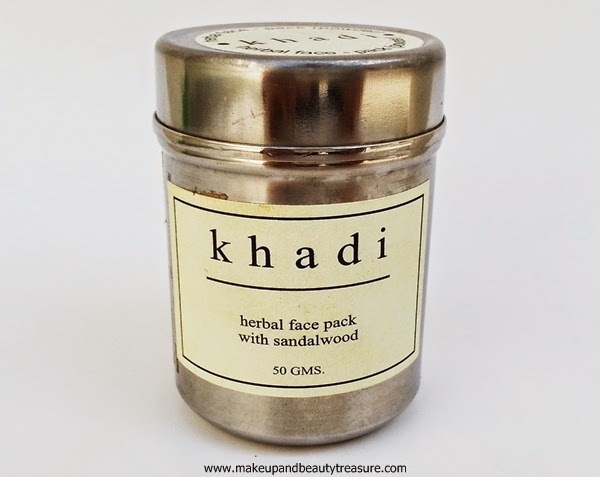 Have you tried Khadi Herbal Sandalwood Face Pack? How was your experience? Share in the comments section below!